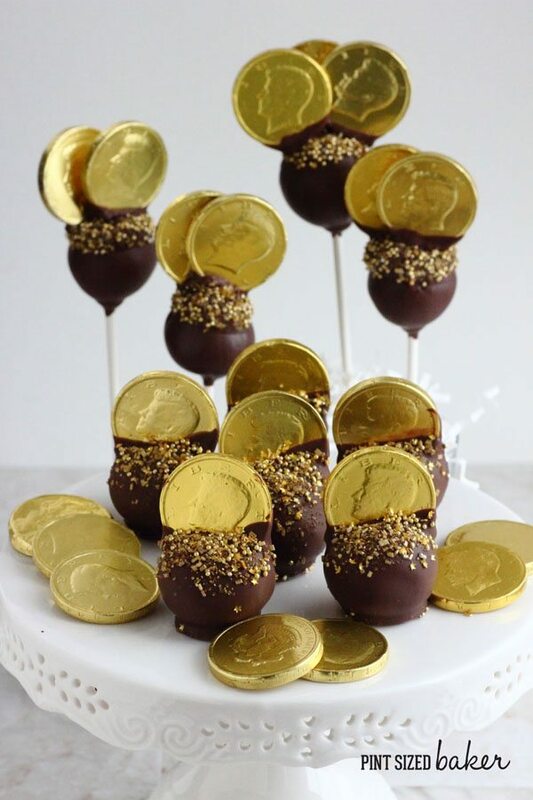 These Gold Doubloons Cake Pops from Pint Sized Baker are a breeze to make and all the kids will love them! Karyn from Pint Sized Baker back again with another Cake Pop Tutorial. Today, I’ve got an easy St. Patrick’s Day Cake Pop idea or you can use it for a little boy’s Jake and the Neverland Pirates themed party. 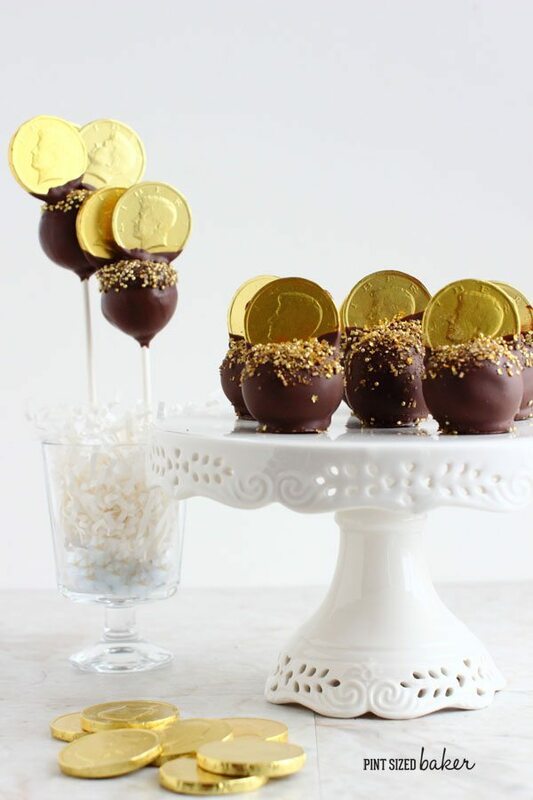 These Gold Doubloons Cake Pops are a breeze to make and all the kids will love them! I looked all over for the gold coins and finally found them in the bulk food section of my grocery store. They are all over the place around Hanukkah, but come to St. Patty’s Day they just couldn’t be found. It’s so frustrating to be out looking for the one crucial thing that you need and can’t find it anywhere. In fact, these were supposed to be pot’s of gold with a rainbow. I couldn’t find the rainbow candy anywhere! I looked in 5 different stores. I finally had to give up and just work with the supplies I had. To make these cake pops, I started off with chocolate cake and frosting. Made my cake pop batter and then dipped them into chocolate candy wafers. Once they were dipped, I added layer of additional chocolate and attached the gold doubloon and gold sprinkles. For the cake truffles, instead of using a stick for my handle, I inserted the coin and used that to hold on to while dipping. I loved the gold sprinkles I used as well. There is a mix of gold stars , gold sugar sprinkles , and mini gold degrees. Fun Cake Pops that are easy to make and the kids can enjoy them for a St. Patrick's Day party or a Jack and the Neverland Pirates party. Bake your cake and let it cool completely. Cut the cake in half and add the frosting to a stand mixer. Use a paddle attachment to mix the cake and frosting into a play-doh consistency. Measure out 1 tablespoon of batter to make your cake balls. Roll smooth and refrigerate while melting the chocolate wafers. Melt the chocolate wafers according the directions until it's 100% melted and completely smooth. For the cake pops, dip the stick into the melted chocolate and then insert into the cake ball. Dip the cake pop and then stand it with the cake pop down, candy apple style, to dry. You want a flat bottom to create what will become a flat top. When all your pops are done, dip the flat bottom into the chocolate and dip a gold coin edge and attach the two together. Spoon the gold sprinkles over top to cover the wet chocolate. You'll have to work quickly before it hardens. Stand up to dry. 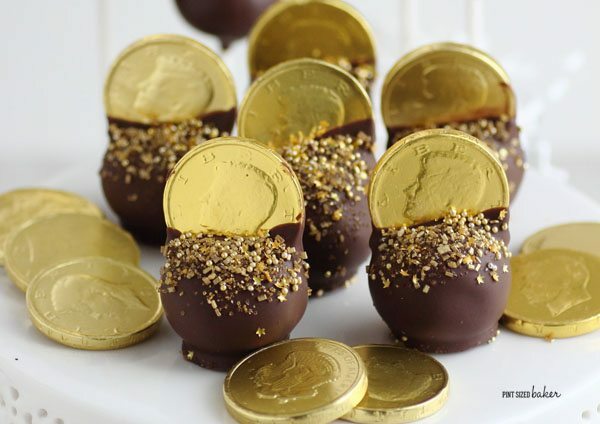 For the truffles, dip a gold coin into the melted chocolate and press it into the cake ball. When you've added the coins to the ball, use the coin as a handle and carefully dip into the melted chocolate. Tap off the excess and place down on wax paper. Spoon over the gold sprinkles from the top. Allow to completely dry. Store in a cool, dry place until ready to serve. I love how they turned out! Wasn’t quite what I wanted, but they still look great. My daughter loved that gold coin gave her extra, extra chocolate! I know that you kids will enjoy them as well! These are SO fun – I absolutely LOVE all the fun gold sprinkly toppings!! These look super cute! I bet they taste like heaven, also. Must try them out for my boyfriend’s birthday. 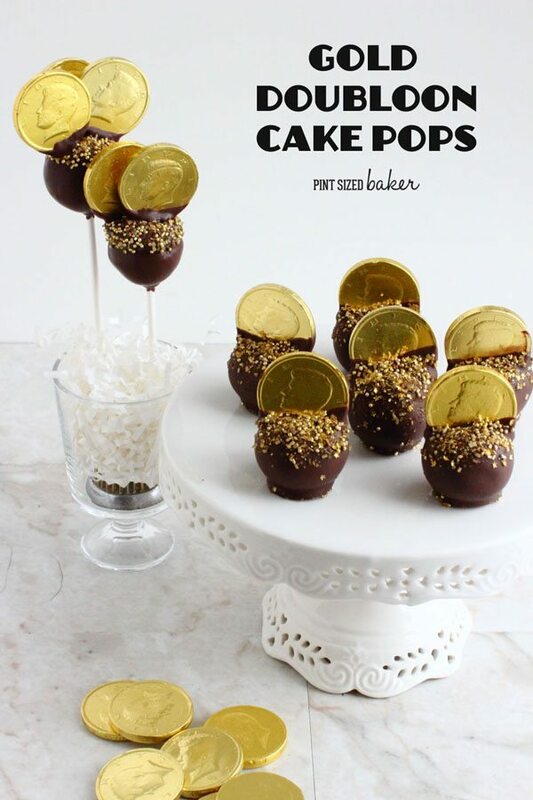 Your gold doubloon cake pops are so adorable. Love them.